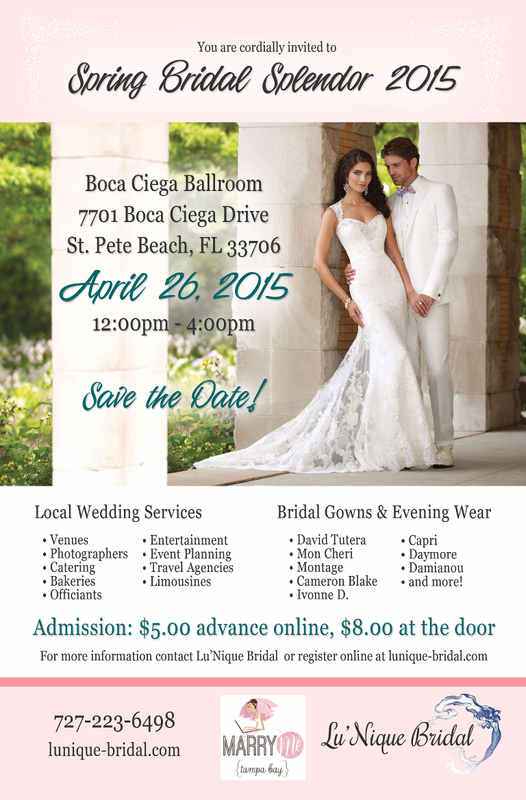 Discover popular and talented wedding professionals at Lu’Nique Bridal Spring Bridal Splendor on Sunday April 26, 2015 from Noon-4 p.m.
Meet some of the Tampa/St. Petersburg area’s finest wedding vendors and view the latest bridal fashions Lu’Nique Bridal. Indulge in food and cake tastings, live music, enter to win amazing giveaways and prizes! Pre-register online for discounted admission or pay $8 at the door. St. Pete Beach bridal shop Lu’Nique Bridal is the exclusive retailer of David Tutera for Mon Cheri.